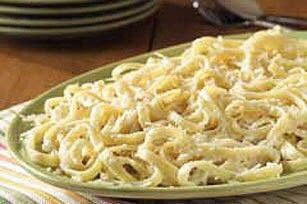 Fettuccini Alfredo from Not-so-Expensive ingredients. My boyfriend makes the greatest Fettuccine Alfredo I've ever had. Unfortunately, making his can drain a bank account. I found a recipe for some that tastes great and doesn't cost near as much. over low heat until smooth. the name cracks me up. lol. and it sounds easy, i think im gona try it. I don't think of myself of poor. lol.